JNN 16 Feb 2014 Bangui : Moving from area to another, Christian mobs have been targeting Muslim places of worship in central Africa, killing Muslims and looting their belongings, as violence rocked the restive country. Of the 36 mosques that had originally stood in Bangui, “today, they are less than ten,” Imam Oumar Kobine Layama, a top Muslim community leader in CAR, told Anadolu Agency. Over the past weeks, thousands of terrified civilian Muslims fled for their lives to escape killings, looting and harassment by armed militias drawn from the Christian majority in the city. Their flight follows months of escalating attacks on Muslims in the strife-torn republic. Going from door to door, anti-balaka Christian militias have raided Muslim homes killing children and women and looting and vandalizing properties, the UN report revealed. 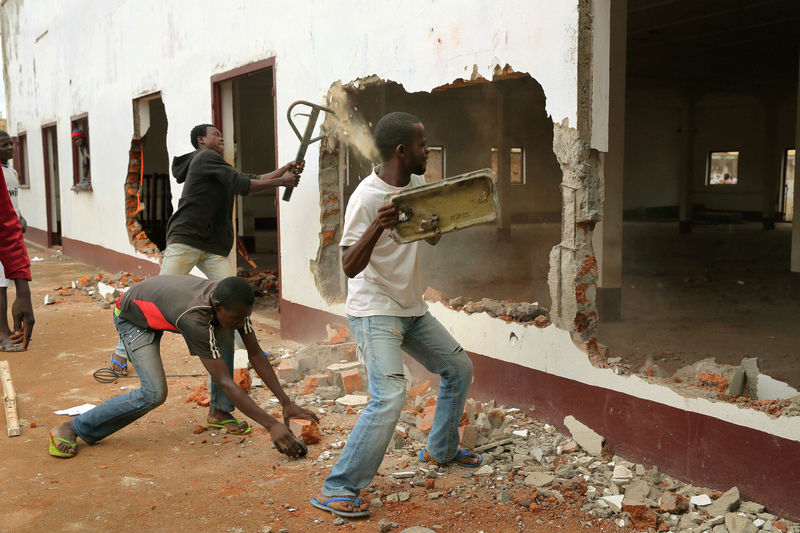 Yet, over the past days, mosques became their latest target as Christian mobs raided a Bangui mosque last Tuesday. “They looted the mosques’ iron sheets, doorframes and windows,” Sherif Wadi, a Muslim eyewitness described the attack with coincided with the release of Amnesty report that denounces targeting Muslims in CAR. According to Imam Layama, at least 67 mosques had been destroyed across the strife-torn country. For Christian mobs, the attacks were targeted at forcing Muslims to abandon their homes and flee abroad. “We’re fed up with Muslims here and want them all to leave,” local resident Hubert Ndho shouted. Despite increasing attacks targeting mosques, some CAR Muslims found their mosque in Kilometer 5 district as the last remaining shelter for thousands of them. “We used to live in harmony with the Christians in this country for many years,” Marriam,.an elderly woman who take refuge at a central mosque in Kilometre 5, told AA. “We don’t know who poisoned their minds to start these [sectarian] murders. “This is our country, but they’re telling us to leave or they will kill us,” Marriam added tearfully. Located in a Muslim detonated district, the mosque serves as a refugee facility where children are playing, women cooking and men patrolling to ensure safety. “I feel safe here,” said Fatima Mahamat, a middle-aged woman. “I used to live in Miskine. Then one evening Christian mobs attacked my home,” she recalled. “We fled and they looted everything.” Mahamat, added. The crowded mosque shelters hundred of displaced Muslims who have brought their belongings and cars. “Many families have come from the countryside, where there is increasing violence, to seek safety here,” said Ramadan, a displaced Muslim. The number of displaced persons at the central mosque remains un-clear. “Sometimes the numbers go up if there is an attack in the area,” said Imam Ahmed Tijani. “But at most there are about 500-700 people living here,” the Imam added. On Tuesday, Amnesty International warned that Anti-Balaka fighters in the Central African Republic were trying to “ethnically cleanse Muslims”. The human rights organization has also accused peacekeeping forces of failing to protect the threatened Muslim minority. The group said that at least 200 killings of Muslim civilians by Christian militia groups known as the anti-balaka. It added that the attacks against Muslims were committed with the government intending to “forcibly displace” the Muslims from the country. This entry was posted in AFRICA and tagged CAR, Central African Republic, Christian Militias, Imam Layama, Imam Oumar Kobine Layama, Mosque, Mosques, Muslim community leader, Muslim places of worship, Muslims. Bookmark the permalink.